Hello from the Design Team at Beaducation! We get very excited to showcase new ways of using products and tools, and today is no exception. 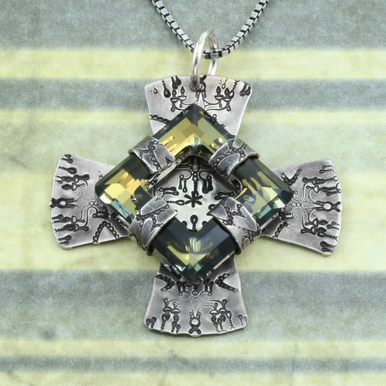 We created a project that we are calling "The Maltese Crystal Cross" and it is making its debut right here on our blog! We have been working with these beautiful Swarovksi Crystal Rings (shown below). We loved seeing the fun projects in the book Metal Jewelry in Bloom, and wanted to replicate some of the techniques author Melissa Cable uses. This project involves using a large circle blank to hold the crystal in place. It's our [easier] take on a prong setting, only ours has an added Beaducation twist -- it's stamped! Check out our DIY design page for this project on our website for a complete list of tools and materials. NOTE: we recommend using a copper or sterling circle blank, as these metals are softer and easier to work with. Any metal will work, it just may require a bit more muscle (and/or annealing) as a precaution to not harm the crystal. To start this project we used a ruler, a circle divider, a Swarovski Crystal Ring, and a 1 1/2" circle blank. By dividing the circle blank into eighths, we created a nice center point which works great as a reference point to center the crystal on the blank. We laid the crystal down and with a Sharpie, traced the outside of the crystal onto the blank. Next, we marked narrow cut lines. Once the metal is cut, these narrow lines will become the actual prongs that will hold the crystal in place. After marking these, we rotated the circle and (as you can see in green) marked a thicker section that will become the actual cross portion of the pendant. We used a pair of Xuron Scissor Shears to make our cuts. It's important to cut a bit farther into the outline of the traced square. This is because we want to make sure the "prongs" are long enough to wrap around the crystal, and cutting in farther allows them to wrap around easier and farther. Any number of design stamps will work well for this next step. We decided to use one our favorites, our Chandelier stamp. We started stamping at the outer edge and made our way around and in toward the center. At the very center, we stamped an asterisk. We did not stamp the prong sections, just the thicker cross portion. We think the chandelier stamp is perfect because it makes a beautiful, opulent pattern when stamped in repetition! We then flipped the piece over and, with a smaller stamp (we used our cute Lacey Heart), proceeded to stamp the prong portion of the blank. We started at the outer edge because it is the most visible when everything is done. As you can see in the pictures, both sides are now stamped. At this point it is a good idea to grab a file, and file down any sharp edges to the cuts. This will not only make the piece more safe and comfortable, but give it a more polished look. We used a pair of coiling pliers to curl the ends of the prongs in towards the center. We rotated the metal ends into a loose, half circle shape in preparation for hugging the stone. While using one hand to hold the crystal in the center of the stamped blank, we used our other hand to bend the top and bottom prongs up against the crystal. We did the same thing with the right and left prongs. It works well to bend two at a time because they effectively keep the crystal in place. To bend the prongs fully down and around the crystal, we used a pair of nylon jaw pliers. These are an ideal tool because they really grab the metal with out leaving any marks or scratches. Gently push the excess portion of metal down and around the crystal ring. To finish the project, we added a jump ring and chain. 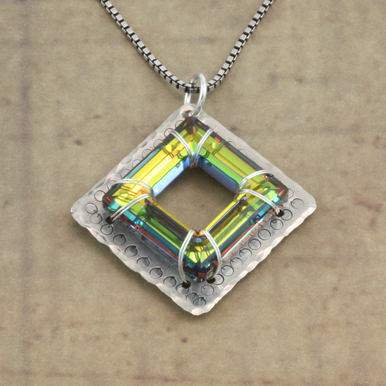 This beautiful pendant is ready to go! We hope you enjoy making these as much as we did. If you like what you see here and want to continue, we have another fun project that uses these Swarovski crystal rings. This project is called Stamped Crystal Washer Necklace (pictured at right). It involves "sewing" the Swarovski crystal to a metal washer using wire. You can check out all of our free projects in the DIY Designs section of our website. We hope our ideas inspire you to keep creating!